All Nippon Airways (ANA), Japan’s largest and only 5-Star airline, today announced the features of Japan’s first Airbus A380, launching in spring 2019. This aircraft will be introduced on ANA’s Tokyo – Honolulu service, and each cabin is specially designed to meet the passenger’s needs on this route. Honolulu is loved by many Japanese families, couples, newlyweds, and Hawaii is a popular destination for their vacations and honeymoons. With this in mind, ANA aims to make their experience onboard more comfortable by strategically designing the cabin features in order to meet their unique needs while providing them with a once in a lifetime experience. In March 2017, ANA announced the special livery motif FLYING HONU. At the time, the design ANA introduced was blue, an homage to the Hawaiian blue sky. Today, ANA is pleased to announce two more colors, green and orange. The emerald green is inspired by the crystal clear waters of the Hawaiian ocean and orange is a reference to the beautiful Hawaiian sunset. In order to make this triad, the FLYING HONUs, more familiar to everyone, ANA has created a character from each aircraft. The blue character is named “Lani,” meaning sky, while the emerald green character is named “Kai,” meaning ocean, and the orange character is named “Ka La,” from the Hawaiian word meaning sunset. In order to provide the perfect trip, ANA has designed each cabin to accommodate a host of needs for passengers of all ages. For example, on the upper deck, ANA has introduced eight First Class seats, 56 Business Class seats, and 73 Premium Economy seats. This marks the first time ANA has offered First Class on this resort route, and its aim is to provide passengers with a luxurious onboard experience. Each seat features its own door and provides passengers with the privacy they need to enjoy their personal space. ANA’s Business Class is a popular option for passengers on honeymoons and family vacations. Therefore, compared to other aircraft where seats are staggered, this revolutionary Business Class offers pairs of seats, allowing passengers to enjoy and share their exciting travel experience sitting next to each other while still keeping all seats with aisle access. Furthermore, while Premium Economy on other aircraft has about 20 seats, the FLYING HONUs offer 73, allowing more passengers the opportunity to experience the premium features. The main deck will have 383 Economy Class seats, which includes 60 couch seats. This makes ANA the first in Japan to introduce a couch seat concept. Each couch is comprised of three or four seats and passengers are able to lie on the seats by folding up the leg rests. In addition, passengers will receive a dedicated mattress that will provide them with further comfort. This new seat concept will especially enable passengers traveling with small children to have a more relaxed experience in the cabin. 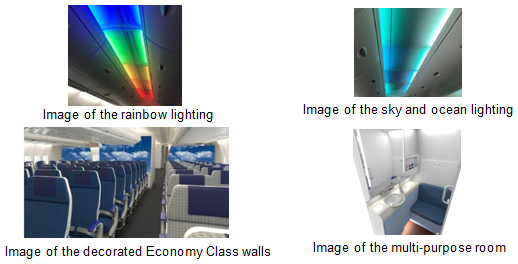 The cabin interiors have also been strategically designed in order for the passengers to feel the spirit of Hawaii from the moment they board the aircraft. The walls and lights have been arranged in such a way as to illustrate Hawaii’s enviable blue skies, sunrises, sunsets, night skies and iconic rainbows. All classes will have access to bar counters. Lastly, behind the main deck, ANA has created a multi-purpose room where new mothers will be able to tend to their babies and passengers will be able to change before arriving at their destination. ANA also created a new concept name called “ANA HAWAii.” By flipping the “ii” 180 degrees, it turns into two exclamation points. This symbolizes the numerous excitements that passengers are able to experience including cabin features, and promotions, as well as the grand opening of a new ANA Lounge at Honolulu Airport.